Governor Terry Branstad today said state prison officials are conducting a “total review” of security at the medical unit on the Iowa State Penitentiary grounds where Sunday’s prison break happened. Twenty-five-year-old Justin Kestner escaped sometime between 1:30 and 4:30 a.m. on Sunday. The inmate stole a car in nearby Wever and made it about 100 miles before his capture mid-morning Sunday just south of Geneseo, Illinois. 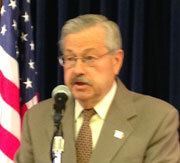 Branstad told reporters this morning at his weekly news conference that there’s no need to increase the number of prison guards in reaction to this incident. A new maximum security prison near the old “Fort” has been built, but design flaws have plagued the project and delayed the new prison’s opening by more than a year. The governor expects inmates to be moved into the new prison sometime later this summer or early this fall.